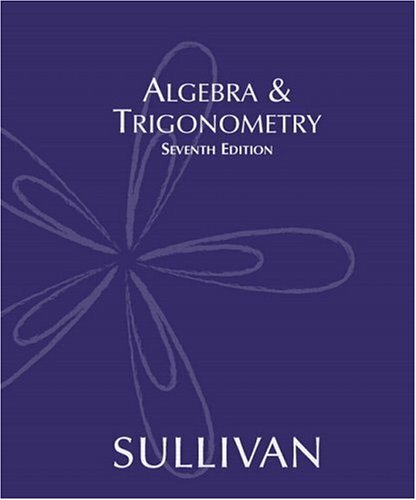 With the sixth edition of this textbook, Sullivan has made significant strides since the fifth edition of the College Algebra portion. The interval notations used to indicate the regions where the value of a function is increasing or decreasing is so much more clear and concise. In contrast to the former use of frequently displaying number lines with pluses and minuses underneath, in which the readings of them were perhaps more of an exercise for the eyes than for the mind, Sullivan revised this mess using parentheses and brackets to indicate test intervals. 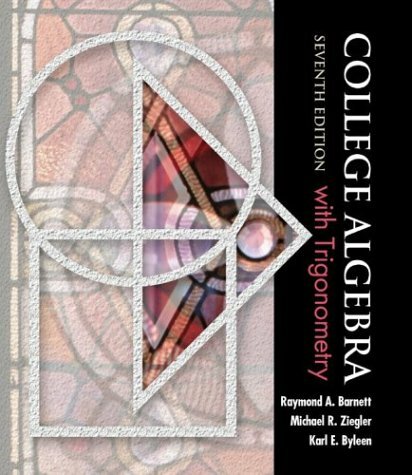 As a teacher, I say that this is not the most user-friendly book for an instructor who teaches one hour college algebra classes three times a week. Oftentimes, for me to quickly get the fundamentals across, I have to paraphrase what Sullivan lays out in many of the sections. The language is often too theoretical for several of my students (Many are in non-technical majors but have to complete college algebra as a last mathematics course requirement), and I have to put the symbolic logic sequences into terms that can cross over to applied mathematics. This is not meant to be a criticism, however. Perhaps the main weaknesses lie in the shortcomings of applied problems, particularly in the sections concerning maxima and minima, and especially in the inequality segments. On a very positive note, however, I will grant that the sixth chapter, which involves logarithms and exponents is quite fascinating. For instance, you have applied problems involving the amount of interest that can be gained after so many years if, say, [money amount]is deposited into an account and accumulates interest at 6% compounded quarterly. Physics problems are also well presented. One interesting tidbit: if you wondered how long it would take for a 300-degree dish to cool down to 100 degrees in an environment that is at room temperature, the formula that can be used, namely Newton's Law of Cooling, is provided. As another example: suppose that a dead animal was discovered in a barn at midnight and its temperature was 80°F° ; the temperature of the barn is kept constant at 60°F; two hours later the temperature of the corpse dropped to 75°F; find the time of death. The formula for this type of problem is also shown. As added kudos, I especially like the intermittent TI-83 calculator tips. The use of technology in mathematics classes is notably increasing in the community colleges. 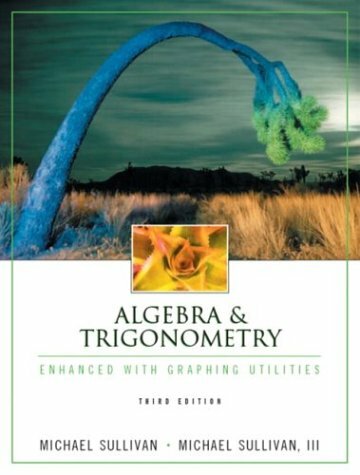 All in all, this is a finer, more updated version, and it is especially recommended for those who want to go beyond the call of duty and discover new ways of applying mathematics to their daily lives. the book. I did not have an instructor and I was not enrolled in a course. I used the book to brush up for calculus after being out of school for 20 years. 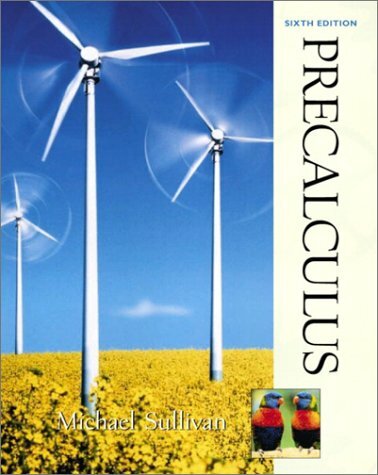 Sullivan's book prepared me for calculus. but certainly not dumbed down. Sullivan trying to get me to see by doing this problem or answering this question". I mention this because this is what Sullivan is really good at; he doesn't spoon feed you. 6)Look, we all want essentially the same things from a textbook. it to solve problems and answer conceptual questions. With Sullivan, you get this in great measure. a great book to learn from and a great book to learn to teach from. One feature I really liked about this book was the "Now work on Problem #..." items, which give you a specific exercise to work on in that section to make sure you understand the concept just covered. Also, the author has highlighted certain exercise problems for a suggested practice test. These are great if you already know some of the material you can just breeze through these until you get stuck on something. The paperback solutions manual was also excellent, I used it a lot since I was teaching myself. This book is NOT the textbook. It is simply the student solutions manual. The textbook is the hardcovered version. It does not come in paperback. This book you are viewing is the student solutions manual ONLY!!! Make sure it's what you want. A good book overall, but could be better. The explanations given by the author were difficult to understand at times, but not so difficult that you couldn't understand it after working through them a few times and doing the questions. It was still hard to get over some of their logic jumps and unexplained assumptions, though. I thought this book used the best possible layout to build upon principles, chapter by chapter. I really didn't feel that any chapter was too easy or too difficult. A lot of thought went into planning the book so the information was learnable, but like I said above, the explanations didn't always effectively teach the information needed to solve the problems. I'm waiting for my book! HEY I HAVE TWO WEEKS WAITING! I REALLY NEED MY BOOK! 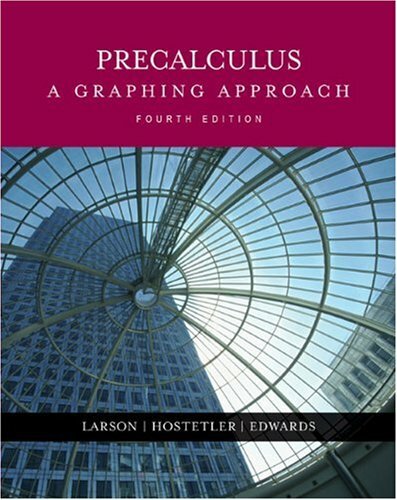 A Must have Pre Calculus Book. I'm really satisfied with the text. Author did a great job explaning whole different aspects of pre cal. He gives nice slick introduction to Limits to prepare you for calculus. My teacher wasnt so great, I dont know how I could have made it in class with any other book. I'm never selling this book. Its a best Math book so far for me. Highly recommended ! This book is very well laid out. It has easy to follow examples in the introduction to the chapters. After each example, you are referred to a homework problem patterned after the example. As you read the introduction, it explains how to solve a particular problem then refers you to say problem 7. If you then go and work problem 7, the ideas you just read are fresh in your mind and and get cemented even more because you are then applying the concept or method you just learned. Its a great way to begin recognizing types of problems and how to go about solving them. I am very pleased over all. I just wish I could get a hold of the solutions manual for this particular edition. 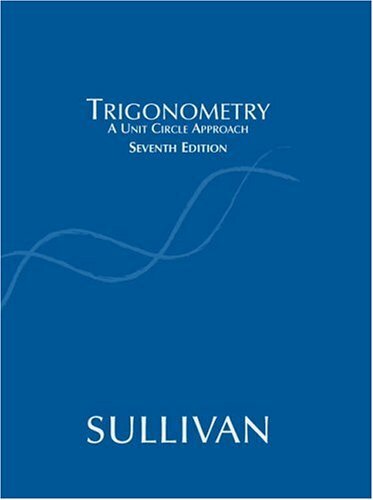 I used this book in a semester trigonometry course (covering Chapters 1 through 8), and the book was not the best.First of all, some lessons contained too much information and some too little.In addition, although the exercises are worthwhile, their difficulty levels differ from question to question, so there is no gradual increase in skill and difficulty.The book only provided good explanations on a couple of topics (for example, inverse trig. 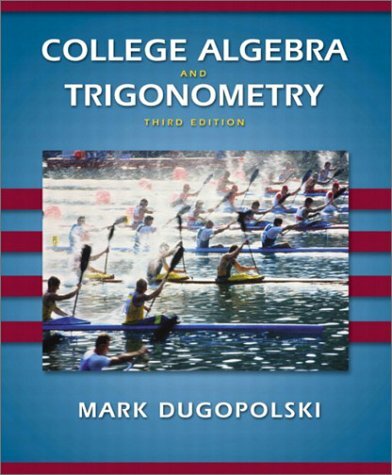 functions).All in all, the book is "okay"; if you have a good instructor, you'll still learn trigonometry. This book really lacks proper theory and instruction. 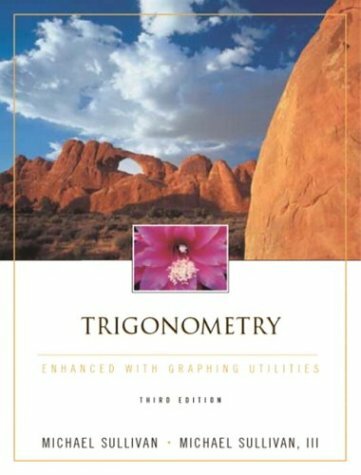 The book focuses more on giving you problems than it does trying to explain the principle and aspect covered in Trigonometry. If you are are looking for a book that can help you out by giving you work(math problems), this is it. Otherwise, stay clear of this book, find a book that has more instructions, more theories, simply more. son trigonometry and it is fantastic. You can't go wrong with this book. Algebra 1 or Calculators for the Stupid? 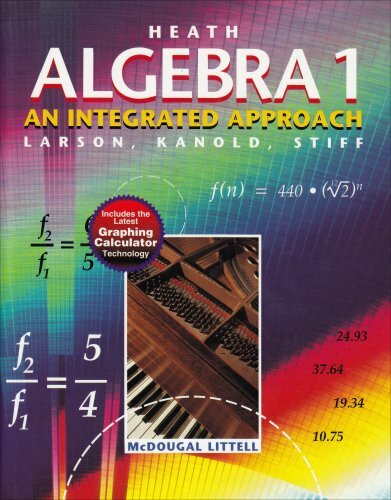 This book pretends to be an Algebra 1 textbook, but is more of a calculator instruction manual. A child who completes a course based upon this book will be highly proficient in the use of his or her calculator, but will not have gained an iota of mathmatical skill or knowledge. If you are considering this book, I suggest you pull the instruction book from the box your calculator came in, it is just as useful and not near as heavy. On the upside, the book has lots of pretty colors. I am student from Oklahoma. 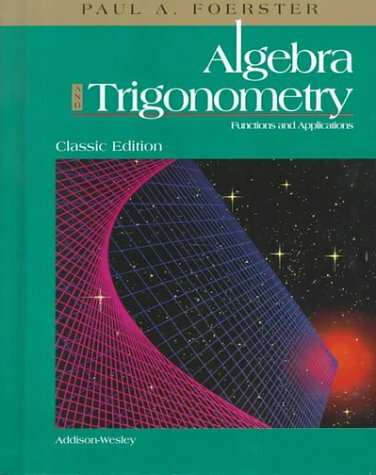 I have used this book in our Algebra I class. This book is truly a terrific book. This book has real-life situations and great examples! If you are planning to buy this book than absolutely do. After you use this book you won't want to buy any other. Heath Algebra I. A book designed for the modern world. 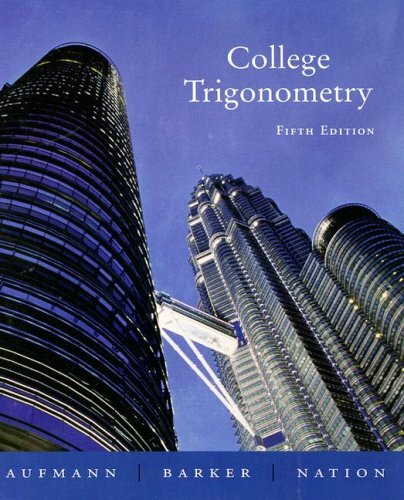 The Fourth Edition of College Trigonometry helps students see the dynamic link between concepts and applications. 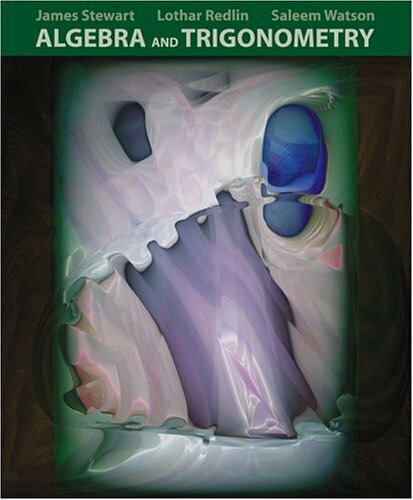 The authors' hallmark approach, the Aufmann Interactive Method, encourages students to interact with math by presenting an annotated example, then guiding students with a Try Exercise, and finally presenting a worked-out solution for immediate reinforcement of the concept. An Instructor's Annotated Edition, unlike any other offered for this course, features reduced student text pages with special instructor resources in the margins: teaching tips, extra examples, ideas for reinforcing concepts, discussion suggestions, highlighted vocabulary and symbols, challenge problems, quizzes, suggested assignments, and references to transparencies that may be found both in the Instructor's Resource Manual and on the web site. Side-by-Side Solutions to examples pair an algebraic solution and a graphical representation to accommodate different learning styles. Integrated web resources include selected Take Note boxes (identified by a special web icon) which direct students to an interactive example or a downloadable file on the web site. These special resources can be used by instructors for presentation purposes or can be assigned to students to help them 'visualize' a concept. Exploring Concepts with Technology, a special end-of-chapter feature, expands on ideas introduced in the text by using technology to investigate extended mathematical applications or topics. Projects at the end of each exercise set are designed to encourage students (or groups of students) to research and write about mathematics and its applications. Additional Projects are included in the Instructor's Resource Manual and on the book's web site. Take Note and Math Matters (formerly called Point of Interest) margin notes alert students about interesting aspects of math history, applications, and points that require special attention. Excellent way to learn trig! 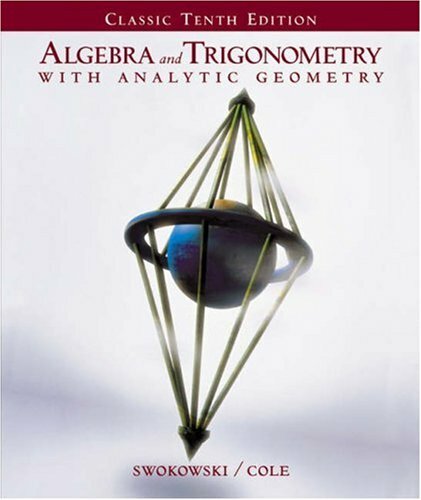 I used this textbook with a high school independent study course that I took through a university.This book taught me more about mathematics than any previous book I have studied. 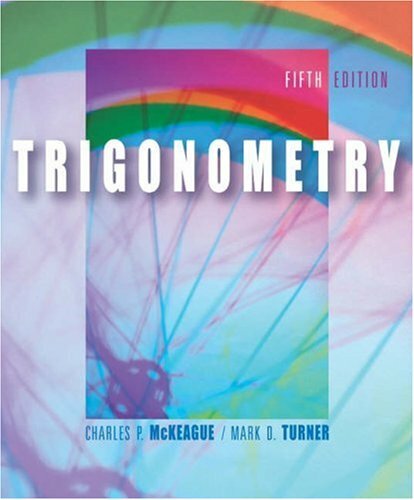 As I said, I used this book with an independent study program, but it was absolutely no problem learning the material.This book teaches you trigonometry in an easy-to-understand and thorough way.I didn't have a teacher, and I didn't need one with this book. What can you say it's a math book? The textbook does not have central focus and all the formulas are not explained properly. The explanations are overbroad and vague and do not focus on the most important stuff. I would not recommend this textbook to any student. The two stars I give is for the nice paper it is printed on. 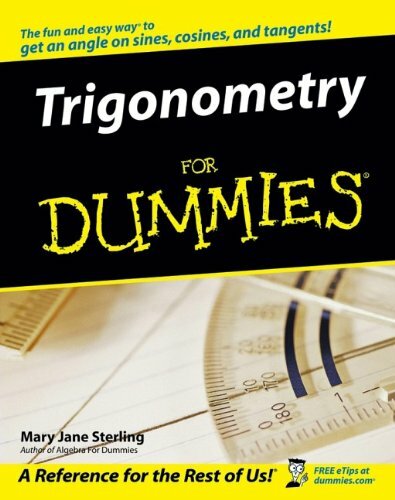 From sines and cosines to logarithms, conic sections, and polynomials, this friendly guide takes the torture out of trigonometry, explaining basic concepts in plain English, offering lots of easy-to-grasp example problems, and adding a dash of humor and fun. 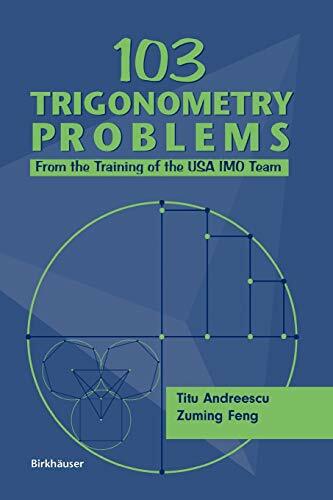 It also explains the "why" of trigonometry, using real-world examples that illustrate the value of trigonometry in a variety of careers. I got the book in 3 days, as promised. Great service. Would recommend it. Thank You. 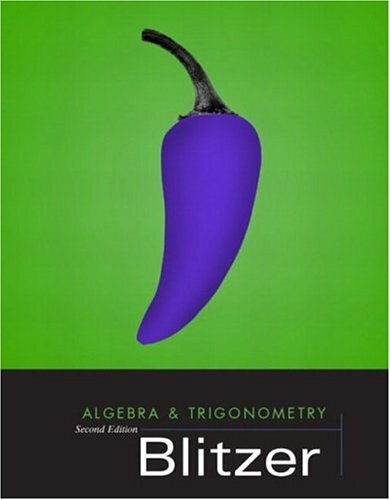 The best math book I've seen--period. After several years in a corporate engineering job, I started moonlighting as a math tutor. The Cliff's Quick Review Guides are wonderful to have in my "back pocket" when I need to quickly look something up that is covered in dust in the "archives of my brain." I'm a (returning :P) university Freshman preparing for the College Board CLEP tests. I was already familiar with the material covered in this book, but needed to refresh my memory. This review turned out to be *exactly* what I needed. The author's ability to explain the material to the student are just shy of enlightening. The discussions & theorem proofs are written in a very concise, clear style. I'm a big advocate of the Cliff's QuickReview series. Intended as a course supplement, these books are also *GREAT* for students wanting to refine their skills. Most of them are also very accessible to students with less familiarity on the subject; trying to learn it for the first time. 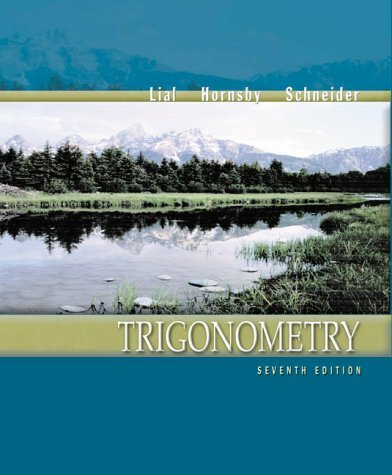 Well laid out book, taking you a step at a time through trigonometry.Frequent reviews of material from previous chapters enables you to stay in touch with the full subject so you can be ready for the cumulative final.Author does a good job of trying to find real world examples, which is not easy. Pretty easy to follow at some points but suddenly the books throws things at you and expects you to "discover" how to solve it.The answer and the easiest way to approach the answer shows up in the next or following sections/chapters.I shouldn't be wasting my time trying to discover something that was discovered centuries ago.Had I not taken a self-paced course, I probably would not have been dissapointed by the book.The instructor would have helped. Also, some references for the HP calc. would have been nice. This is a good book, with decent summaries and reference points.Neatly organized unlike my current Calc book. 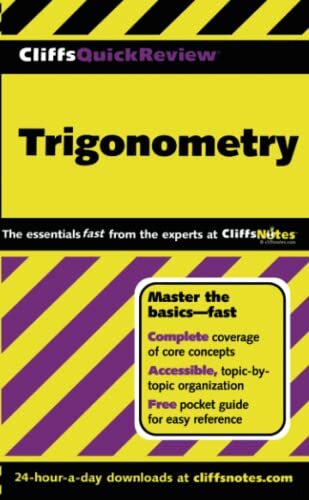 This trig book covers all the basics of trigonometry without watering it down with too much algebra. Applications like the human cannonball andothers hold the students interest.